If you don't see a menu below, please click on the above logo. Your browser does not support script. Please use the links at bottom of page. 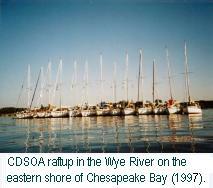 The CDSOA, Inc. is a national organization of Cape Dory and Robinhood sailboat owners incorporated in the State of Maryland. We have members from Washington State to Florida, California to Maine and beyond, and are always looking for new Cape Dory, Intrepid and Robinhood owners to join us. We offer a strong national alliance of Cape Dory boats and have a system in place to charter local area fleets. There are three levels of membership: Voting, Associate and Honorary. Though the emphasis of the organization is on Cape Dory sailboats, we welcome Cape Dory and Robinhood powerboat owners to join as Associate members and to participate in all of our activities. 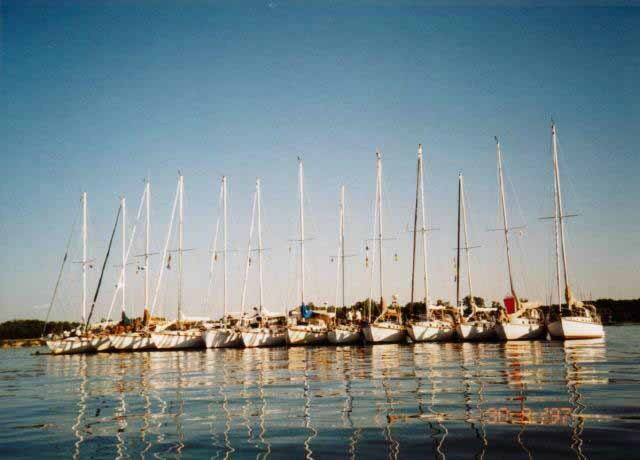 The purpose of the association is to advance the sport of yachting and the individual and family enjoyment thereof; to promote the educational and technical interest of the membership and to enhance the social enjoyment and good fellowship among the owners of Cape Dory sailboats. How do Cape Dory owners benefit? All members have unrestricted access to our online newsletter MASTHEAD as part of their annual membership. And, membership has other advantages too. See Member Benefits for a current list of merchants offering special discounts or benefits to CDSOA members. In addition, we also have a very active message board, the Cape Dory Board, where all boat owners are welcome to submit their questions, comments and resolutions regarding our boats. Although CDSOA membership is not a requirement to take advantage of our web site and the Cape Dory Board, please keep in mind that it is paid for by membership dollars, so why not join? The CDSOA regularly organizes meetings and events, both on and off the water, in each of our regions. And on this web site you'll find information regarding upcoming general and fleet events, details and contact information regarding our regional fleets, as well as news regarding the CDSOA and its officers. We also offer a catalog of custom CDSOA items including burgees, hats, T-shirts, monogrammed polo shirts, towels, etc. Contact Sandy Davis regarding Chandlery items or visit our online store. How do I join or renew my CDSOA membership? To join or renew, print and fill out the membership/renewal form. CLICK HERE for the PDF version** or CLICK HERE for the Microsoft Word version of the form. Mail the completed form, along with your check for $40.00 to our Memberhip Cochairman Steve Kuhar at 5824 Curtis Road, Pace, FL 32571. All CDSOA memberships expire on December 31st of each year, so don't wait to renew! **NOTE: Adobe Acrobat Reader must be installed on your computer in order to download and open PDF files. If you don't have the latest version of Adobe Acrobat Reader, download it, free of charge, from Adobe's website. Disclaimer: The CDSOA is a private voluntary social club. The CDSOA and this Web site are not associated with and do not represent Cape Dory Yachts, which is a division of Newport Shipyards Corp., nor any of the other businesses or individuals mentioned herein. Modified by: Catherine Monaghan, Webmaster -- CDSOA, Inc.
©CDSOA and the CDSOA logo are the property of the Cape Dory Sailboat Owners Association, Inc.. Use, reproduction, copying or redistribution of same without the written permission of the CDSOA, Inc. is prohibited. All other trademarks or servicemarks appearing on the Site are the marks of their respective owners.